GaGaalinG was formed in 2005 after vocalist and fashion model MYM went to a Rolling Stones concert by chance. She was overwhelmed by the band’s performance and, despite having little interest in music to begin with, was inspired to create and be in a band herself. This was by no means her last concert and she soon began attending more shows. It was during a concert that she met MOTO, who later became the guitarist of her band, as well as CHERRY (ex-LINDBERG), who became the drummer. It didn’t take long for the band to record their debut album ROYAL PUNX, which was released on April 13th. For the rest of the year they played concerts and concurrently MYM continued with her modelling. In November, MYM released a book called Tsuyoi namida which detailed the history of GaGaalinG and her meeting with the famous artist RIKKI. In January 2006, GaGaalinG released the single Ai no chikara ~born to be loved~, which was used as a commercial song for the “Puchi” series by M-1 Bourbon Inc. Several singles later in June, GaGaalinG released their second album, ROYAL BLOOD. For the rest of the year the band was very active with concerts and not only made their name known in Japan, but also abroad. 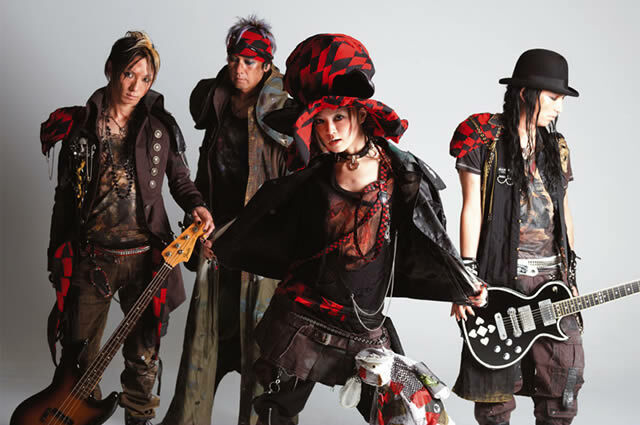 From February through April 2007, they played several one-man concerts and in September their support bassist, JUN (ex-Waive), became an official member of GaGaalinG. Later that year, they released two new singles: RENDEZVOUS and i-SCREAM MACHINE. The following year brought more releases, starting with the single Pierce in February. Amidst touring in March and April, they released their third full album, Royal Stranger. That summer, GaGaalinG took on a more active stance regarding overseas promotion, releasing Royal Stranger in various European countries. They were invited to perform at the American anime convention Anime Expo in July and so had the opportunity to perform overseas for the first time. If they weren’t active enough already, another release came out in November: their mini-album ALICE. In December the band planned to perform in Russia, but this performance was cancelled. In 2009 it grew quiet around the band and no new releases came out. While it appeared GaGaalinG was on a break, JUN started the project O-PARTS with which he released a CD and performed several shows. With the strong decrease of activities, it didn’t come as a large surprise for fans when a statement was issued in March 2010 announcing that GaGaalinG would be disbanding. Musical differences were cited as the reason. In April, the band held their last concert, during which MYM announced she would be stopping music activities altogether. MOTO and CHERRY did not start up new bands either and the only one to continue immediately was JUN, who worked on the revival of his former band WAIVE and then supported the band Annie’s Black for a while. GaGaalinG was a unique band that stood out in the Japanese music scene. They were a welcome change between the thirteen-in-a-dozen upcoming bands and it is truly a pity they will not continue their career for they seemed to have a promising future ahead of them.